Crafters Companion > Blog > New Crafter’s Companion stamps designed by Donna Ratcliff- Available Now! New Crafter’s Companion stamps designed by Donna Ratcliff- Available Now! Did you catch last weeks shows featuring these stunning stamps designed by Donna Ratcliff? We love them so much that we’re getting into the ‘Christmas Spirit’ with this lovely tutorial from Julie! 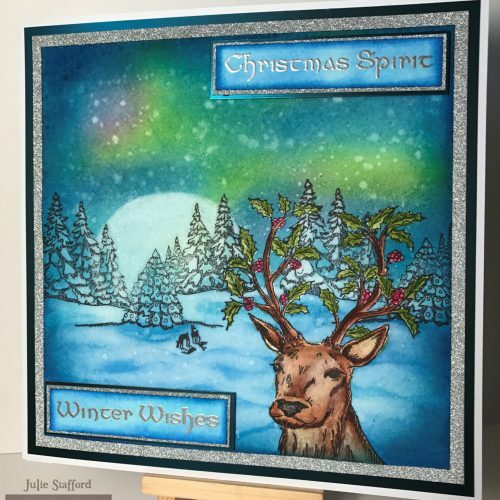 Cut a piece of Sheena stamping card 7″ x 7″, and stamp the festive stag . dry thoroughly and then mask the image using Pebeo Drawing Gum. Allow the drawing gum to dry before continuing. Using the winter night stamp, stamp the background behind the stag. Here I stamped twice, slightly offsetting one to create a landscape feel. Then created the the moon using the faux bleaching method with water. for the moon , lightly draw around a circular object or create freehand. only add as much water as you can control on you’re brush , blotting with tissue as you work. The highlights were also faux bleached, concentrating on the areas around the moon , the edges of the trees and the landscape in the foreground. Finally add snow to the image by tapping water from you’re brush and blotting away. To add some sparkle to the image, I used a clear sparkle pen over the highlighted areas . To create the vignette feel around the outside , I used Marine and Navy Aqua pens with glycerine. For the last stage, I stamped and embossed my sentiments . I have shaded the edges of these with the same blues as the main image. For my mats and layers on the card and the sentiments I used the Ice Blue Luxury Card Stock, Matt, Miri and glitter.